Take on the challenge of completing 19+ trail miles over the course of the weekend, with the James River Scramble on Saturday, May 18, at 9am and Bust the Banks Half Marathon on Sunday, May 19, at 8am! With two courses in two days this challenge comes with some serious bragging rights! Includes: a short-sleeved technical shirt, finisher items, virtual goodie bag, post-race beer or soda, and a free concert. All participants must be at least 12 years old to participate. We ask that all children under the age of 14 be accompanied by an adult. Brand new Start and Course, including way more trail and less pavement! This year, the James River Scramble will start on the south side of the river, just over the T. Tyler Potterfield Memorial Bridge. 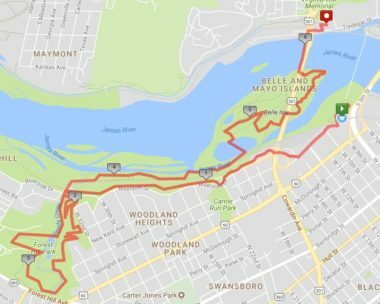 Note about Course Map: As is the nature of trail races, it can be difficult to create a map that accurately reflects the true distance of the course. Please keep in mind that this map is intended to give you a better understanding of the course and that the race route is approximately a 10k. There are seven (7) water stops along the course, located approximately every two miles. Please note that some water stops will be self-serve. Click Here for a downloadable PDF of the course map. Click here for an interactive Map My Run version course map. Note about Course Map: As is the nature of trail races, it can be difficult to create a map that accurately reflects the true distance of the course. Please keep in mind that this map is intended to give you a better understanding of the course and that the race route has been accurately measured to be a half marathon. The great trails along the banks of the James River will provide a tough test for all in the Bust the Banks Half Marathon at Dominion Energy Riverrock. There is no time wasted in hitting the trails as participants will head west and quickly access the North Bank Trail. Make sure to get a good view of Hollywood Rapids because after that the trail becomes challenging with some steep descents and ascents as well as some rocky terrain. The trail flattens out on the south side of Maymont as the course approaches the first crossing of the James River at the Nickel Bridge. After the bridge, the south side of the James River brings on the technical trails of the Buttermilk Trail. At the Reedy Creek parking lot, the course goes under Riverside Drive and the difficult undulations and switchbacks of the Forest Hill Park Trails are up next. After completing these trails the course goes back through the Reedy Creek tubes underneath Riverside Drive coming out right near the James River Park System headquarters and then heads east on the Reedy Creek Trail. After a quick loop past and then back to the 22nd Street Stairs, participants will climb up the stairs and head east on the Buttermilk East Trail. The exit of this trail brings about an easier path to the finish line. A quick jaunt along Railroad Avenue and across the railroad track pedestrian bridge will get participants to the floodwall. It is here that participants have the finish line in sight along with the beautiful views of the Richmond skyline. A little more work is required though as the course exits the floodwall and crosses over the James River a second time via the 14th Street Bridge (staying on the sidewalk). Once over the bridge we will access Brown’s Island by way of the Canal Walk. You will run on the lower path of Brown’s Island towards Tredegar Street and pass Historic Tredegar on your right, heading towards the Belle Isle Lot where the finish line awaits you!